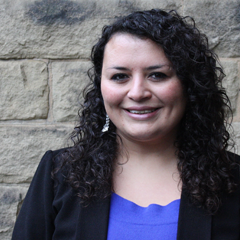 Dr Marcia Vera Espinoza is a Lecturer in Human Geography at Queen Mary University of London. She is also Associate Researcher in the MIGPROSP project. Her research interests are in refugee and migrant integration, international and regional migration governance, forced migration and immigration policies in Latin America. Marcia has recently published in Global Policy, Forced Migration Review and Development Policy Review. She completed her BA at the University of Chile, followed by an MA in International Studies and a PhD, based in Geography, at the University of Sheffield. Geddes, A., Vera Espinoza, M., Hadj-Abdou, L. and Brumat L. (eds) (Forthcoming) The Dynamics of Regional Migration Governance. Cheltenham: Edward Elgar Publishing. Oldekop, J., Fontana, L., Grugel, J., Roughton, N., Adu, E.A., Bird, G., Wallin, S., Dorgan, A., Vera Espinoza, M., Hammett, D., et al. (2015) ‘Hundred Key Research Questions in International Development’, UNRISD/SIID working paper, January 2015. Vera Espinoza, M. and Connelly, S. (2018) Understanding ethics of doing interdisciplinary research with refugee communities (or trying to!). SIID Blog, The Sheffield Institute for International Development. 01 August 2018. Acosta, D., Vera Espinoza, M. and Brumat, L. (2018) The New Chilean Government and its Shifting Attitudes on Migration Governance. Migration Policy Centre Blog, EUI. 03 May 2018. Acosta, D., Vera Espinoza, M. and Brumat, L. (2018) Brazil´s Migration Governance: Hidden Actors, the New Law and the 2018 Presidential Elections. Migration Policy Centre Blog, EUI. 20 February 2018. Vera Espinoza, M. (2017) Is Latin America ready to accept more resettled refugees?, The Conversation. 11 October 2017. Vera Espinoza, M., Sandelind, C. and Ni Ghráinne, B. (2017) “Safe return review” refugee policy: counter-productive and morally indefensible, LSE British Politics and Policy. 25 May 2017. Vera Espinoza, M (2016) How can global migration governance find innovative solutions in times of anti-immigrant sentiment? MIGPROSP Blog, 19 December 2016. Vera Espinoza, M (2016) Rethinking Refugee Integration through the experiences of resettlement in Latin America. Refugee Resettlement Conference Blogs. Sussex Centre for Migration Research.16 September 2016.